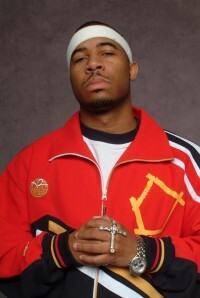 Once a member of profane hit makers Three 6 Mafia, MR DEL is a powerful minister of the gospel, as Tony Cummings reports. Delmar Lawrence, otherwise known as holy hip-hop man Mr Del, has done well with his storming album 'The Future', the first under EMI Gospel's tie-up with Mr Del's label, Holy South Records. The rapper, songwriter and producer from Memphis, Tennessee is no newcomer to the hip-hop scene. In fact, before his spectacular conversion he had seen the big time with the highly successful, highly profane rap crew Three 6 Mafia. Mr Del told CCM magazine about his troubled upbringing. "I came from 'edgy beginnings.' I grew up in an abusive household. Not wanting to go home to abuse, I stayed in the streets and was basically raised by the streets, which is no place for a child. I had to witness and experience adult situations and issues at a very young age. Having never known my natural father only added to the madness and rebellion. There was no positive male role model to take me under his wing. But I don't say this to get pity; I think it's incredible that God gets all the glory for the man I am now and for the man I am becoming." It was hip-hop music that was to pull Del from the deprivation and violence of the Memphis ghetto. Mr Del spoke to Gospel Flava about his formative years with Three 6 Mafia. "We all grew up in the same hood in Memphis. We started out just having passion for music. We were doing underground mix tapes, selling them at schools, on the streets and in stereo mix stores. People were feeling the music so much that it grew. The tapes would go outside of our hood into other neighbourhoods and it got real big. From that, we just blew up, having a big presence in Memphis. We then got an independent deal. We hooked up with a guy who financed us to go into a real studio and record an album. It pretty much took off from there." Then in 2000 with best selling albums and nationwide exposure, Mr Del began to see something was missing in his life. "I grew up in the church, as far as my mother dragging me there. I really wasn't that into it. I was in the streets doing whatever. Being in that atmosphere made me aware of God and who he was, but I didn't have a relationship with him. Being out in those streets, I got into a lot of things that a regular street teenager would get into. I was with Three 6 Mafia and we were touring, doing BET, and got a gold record." "It came to a point where this was something I wanted to do but I really wasn't happy in my soul with that. So, I came off a tour one Easter Sunday and went to surprise my family. I hadn't seen them in four months of me being on the road. God spoke to me like right there. I wasn't even listening to the pastor. I couldn't tell you today what he was preaching about. I just know that I had an experience with God. I heard his voice and he told me to come out. I asked him, 'What do you mean, come out? What do you want me to do?' He said, 'I want you to do the same thing you're doing now. Just do it for me.' I was saying that gospel rap was corny and I couldn't do that. Then he began to show me visions of auditoriums and young people and all of this stuff. When I saw that, something in me was convinced and I said, 'Okay God. If I do this, you're going to have to take care of me.' After all, this was all that I wanted to do and I'm not about to leave one lifestyle just to step out on nothing and not know what's what. He told me to trust him. The next day, I went to the label and told them I was leaving." While Mr Del's decision to leave the label and Three 6 Mafia was swift, the repercussions were to be felt for a while to come. To say that the rest of Three 6 Mafia were displeased with Mr Del's Christian conversion is an understatement. "I had to leave Memphis," Del continued. "They put a hit out on me because they felt like I was sabotaging their group. A lot of their sales started to decrease and I started getting interviews and being on TV saying that I was renouncing Three 6. So, instead of looking at it as changing my life, they looked at it like it was an attack on them. Being that all of us are street cats, we handle things according to the street code. They were ready to kill me. So, I had to leave. I just had to get away. It was more of a spiritual attack to me, because it almost made me not do what I'm doing now. I was so afraid because I know what they are capable of. I know what they've done. "When I went out of town, I used all that time to be in his Word. That's when I got a relationship with him. I was reading Scriptures like 'Fear is not of God', and 'no weapon formed against me shall prosper.' This is stuff that church folks chant all the time but it was real to me because I was going through something at that time. That's all I had to believe in. God told me to turn in my gun. So, it wasn't like I was thinking in the same mind frame. I really was trying to do this thing for real. So I took my gun back to the pawnshop and I didn't have any protection but him. "All I had to do was believe what his Word was saying to me. Once I finally got up enough strength and courage in God's Word, I came back to Memphis and started my ministry. Don't get it twisted. I was still kind of shaky about going certain places. But the more people kept on speaking into my life and the more I kept ministering, the more I didn't worry about it. After a while, I saw those cats. I would see them on the street and I would go right up in their face and speak. For the first couple of times they were shocked. But after a while, I guess that love broke them down. I stopped hearing about the death threats and the hit. They started opening up and talking to me. Now, I know they probably still talk about me behind my back but in public, I don't see this at all. To this day, I don't see that. And it's funny, because we all live in the same neighbourhood." Now Mr Del is keen to build his Holy South Records to become a major force in hip-hop. He said, "It is a record label that produces hip-hop in Christ. Not 'Christian hip-hop' or 'gospel rap' but hip-hop in Christ. It's a movement of a hip-hop generation, surrounded by hip-hop culture - but representing the lifestyle of Christ." I Heard some of your records and i like them alot but thrilla is hot and your testmony about your mom is good and about your step dad keep bringing those hits mann but like you said its all about jesus and we need more holyghost soiders dog hopefully we will do a track some day when god elevate me and some of my patners to do some music but till then we just got to keep the focus on winning souls and spreading this gospel. mr. del you came to our church youth prais party(June 26,2009(TVC NW))and you moved many people showing them that if you trust God he will give you things you will never belive thats possible and i just want to thank you and say God ,TVC,and I,love you and can you tell swag i said hi also. I totally believe that Musique is takin back its rightful place en I also blive wat Mr. Del said once. He said that tha devil don't own no music, it all belongz to God en God is just using His people to take it back where it came from. Remember Gospel music was the first music to exist before HE LAID THA FOUNDATIONS OF THA EARTH. Keep reppin Mr. Del. Like the bible says, it's the sick who need a doctor.. It's great that you can reach the people who would otherwise not listen to songs with Christian lyrics. God has relly out you on my heart to pray for you and to continue to pray for you. Man of God be incourage and may God continue to keep you from harms way. Women of God Nisha.